All of us gardeners and non-gardeners alike have been enthralled lately with the lovely fall colors. For me it's the reds that really grab me. Okay, maybe the oranges too. But every year that my 'Bloodgood' Japanese Maple turns this red I'm one happy woman. This picture is from December of last year. Right now this maple is still mostly burgundy. Soon it'll be almost blood red. But this time of year I also have one little plant that starts turning a brilliant green. It's the mosses that come up in the cracks between and outside the pavers. Can you believe this green color in the sea of autumnal foliage? I used to know the names of mosses when I took botany courses but those have long since disappeared from my brain. But I don't really care, whatever we humans call them, I think they're extraordinarily beautiful and interesting. Beautiful reds and yes I love that green moss! 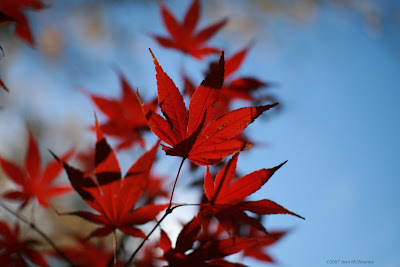 Beautiful photo of the maple - unfortunately because of our subtropical climate, we don't get to appreciate autumn foliage when it comes round. Lots of moss though!